I need some sort of server rack in the basement. Well, I call it a server rack ... but it won't have a server. It will have a patch panel, switch, cable modem and some other computer related stuff (parts, bits and bobs, etc). 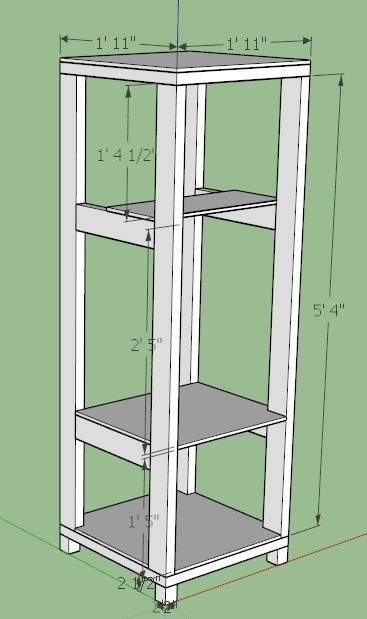 I was doing some googling and found a DIY server rack made from 2x4. Why not - I can do that. I roped in a friend (David!) who just happens to have some wood cutting equipment that I envy and we've been bouncing ideas back and forth. I then youtube'd some DIY 2x4 fun and found someone making a blanket box. He mentioned a piece of software called sketchup (about 20 seconds in). My thinking is that the bottom section will contain plastic contains that will contain computer stuff (old fans, wireless cards, manuals, etc), the 2nd section will be open for possible future expansion (NAS?) while the top section will contain the patch panel (positioned under the shelf), the switch and cable modem (on top of the shelf). I plan putting some plywood all the way down the left side and this will hold the service loop for the Ethernet, coax, etc. I'll probably hand a powerboard down one of the columns. My basement is unfinished so it gets some dust. I am concerned about the dust level so I will monitor the situation. 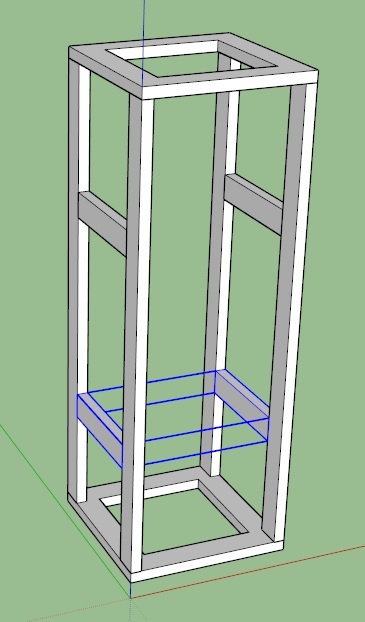 If it turns out to be too dusty, then I will seal the server rack in ... doors at the front and back, plexiglas (perspex, Optix, etc ... apparently it has lots of names, some of them regional and some are trade names). I'll need to put in computer fans, dust filters, etc, etc ... but that is another story. What ever I do with the open server rack will need to keep the possibility of requiring sealing in mind. Here is the view of just the 2x4 (actually, 1.5 x 3.5). The bottom (blue) side supports could also be slotted angles. 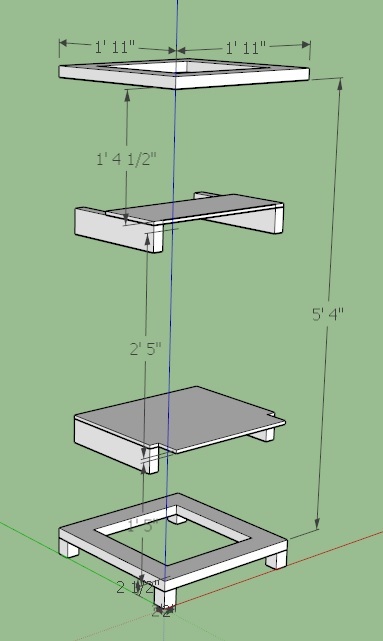 I will be keeping the top side supports for stability and also for patch panel support. 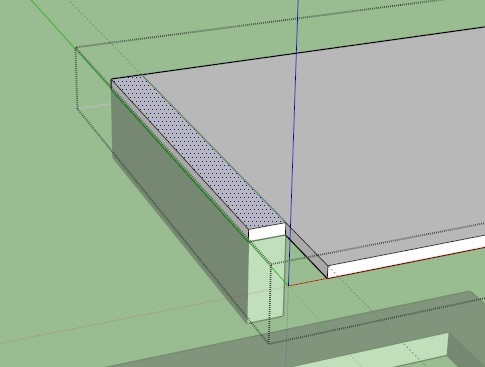 If we do go with slotted angles then we can cut away a bit of plywood there - this would improve ventilation in the sealed server rack version. Let me know if you want to see any additional views, missing elements, etc.